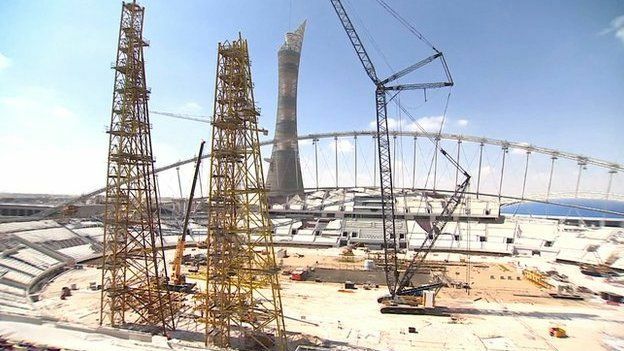 Fifa sponsors are being asked by a new campaign grouping to speak out about working conditions at the 2022 World Cup building sites in Qatar. The working and housing conditions of migrant construction workers have been heavily criticised. International Trade Union Confederation (ITUC) leader Sharan Burrow said the work conditions were “simply slavery”. Letters have been sent to eight big sponsors urging them to use their position to put pressure on Fifa. They are Adidas, Gazprom, Hyundai, Kia, McDonald’s, Budweiser, Coca-Cola and Visa. There was some pressure from sponsors last year over the actual awarding of the World Cup to Qatar. However, now that it is definitely going ahead in the emirate, Fifa commercial partners are being asked to speak out against employment conditions. The 2022 World Cup has kicked off a multi-billion-dollar construction boom in Qatar, and roads and hotels – as well as stadiums – are being built to accommodate the fans and businesses that will flock to the emirate. Hundreds of migrant workers, many from earthquake-hit Nepal and other parts of South Asia, such as Sri Lanka and Bangladesh, have died in Qatar and a significant number are believed to have suffered injuries as a result of unsafe working practices. 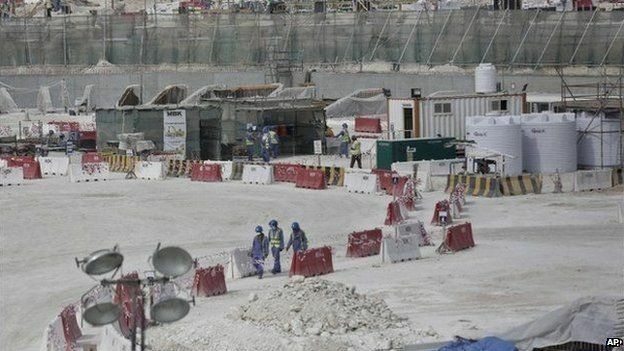 Qatari authorities say they have made improvements in conditions for hundreds of thousands of migrant workers, but the issue hit the headlines again when a BBC reporter was detained for endeavouring to see labour and living conditions first-hand. “Everyone who is part of Fifa’s family, as the sponsors are, has a responsibility about what is going on in Qatar, about the abysmal conditions, and numerous deaths, of migrant workers,” Damian Collins MP, who is a leading force in body New Fifa Now, told the BBC. As well as the death toll and working conditions, other criticisms focus on the non-payment of wages, poor quality accommodation and a lack of freedom to change jobs or leave the country. As well as New Fifa Now and ITUC, the call to sponsors has also been backed by Stephen Russell of Play Fair Qatar, which has the backing of the UK’s Trade Union Congress (TUC). Mr Russell said that “as things stand, more than 62 workers will die for each game played during the 2022 tournament”. The new initiative has been co-ordinated by specialist sportswear firm Skins, whose chairman, Jaimie Fuller, recently visited Qatar and got inside some workers’ camps. As well as conditions in the camps, he is also critical of the “kafala” system of system of work sponsorship, whereby employers, in effect, own labourers and control their freedom to leave the country. “We believe Fifa’s partners and sponsors should be asserting their own values to ensure Fifa operates in a way that ensures football, like all sport, is a vehicle for positive social change. In Qatar, where migrant workers are literally dying on the job, it isn’t,” said Mr Fuller, an outspoken critic of corruption in sport. Qatari authorities claim to have improved conditions for hundreds of thousands of migrant workers. In May 2014, under scrutiny from Fifa, the media and human rights campaigners, the government in Qatar pledged to reform the restrictive kafala system and promised to implement proposed changes “as quickly as possible”. “The Government Communications Office invited a dozen reporters to see – first-hand – some sub-standard labour accommodation as well as some of the newer labour villages. We gave the reporters free rein to interview whomever they chose and to roam unaccompanied in the labour villages. “We are pleased that the BBC team has been released but we deplore the fact that they were detained in the first place. Their presence in Qatar was no secret and they were engaged in a perfectly proper piece of journalism. In December, the nation’s emir – Sheikh Tamim bin Hamad al-Thani – admitted there had been “errors and problems”, but that authorities were “working seriously on improving the situation”. However, human rights groups have complained about the slow speed of changes. In March, Fifa President Sepp Blatter told Qatar’s emir that the 2022 World Cup host nation must to do more to improve working conditions for migrant workers.